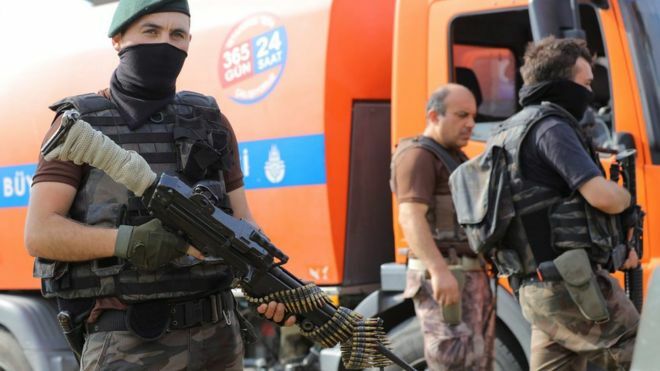 Turkish officials say that nearly 8,000 police officers have been suspended on suspicion of having links to the coup attempt at the weekend. Some 6,000 members of the judiciary and military, including generals, have been detained. President Recep Tayyip Erdogan vowed to purge state bodies of the "virus" that had caused the revolt. The US Secretary of State, John Kerry, has stressed the importance of democratic rule. Speaking in Brussels where he has been meeting European foreign ministers, Mr Kerry said the US stood squarely on the side of the elected leadership in Turkey: "We will certainly support bringing perpetrators of the coup to justice - but we also caution against a reach that goes well beyond that." Turkish Prime Minister Binali Yildirim said that 208 "martyrs" had lost their lives during the failed coup attempt, including 60 police, three soldiers and 145 civilians. Another 1,491 were injured, he said. Twenty-four alleged coup plotters were killed, Mr Yildirim said - a smaller number than Turkish officials previously reported. Three years ago when the AK Party government began its fight against Fethullah Gulen - a cleric in self-imposed exile in the US, who was a close ally of Mr Erdogan for years - it began with the police department. The government knew where to find Gulen supporters, in part because it had helped them to take positions within the police when they were still allies. When the fight against Gulen movement started thousands of police were moved sideways into roles where they would not harm the government. Now, instead of being reshuffled, thousands of police personnel have been suspended from their duties. Obviously Mr Erdogan has little room for taking risks. In a country which also faces threats from so-called Islamic State and Kurdish militants in its big cities, and has been targeted by suicide bombs, it is difficult to predict what the result of these large-scale suspensions will be. But with these personnel or without them, it will take time for anyone in Turkey to feel safe. More than 100 generals and admirals have been detained in raids across the country. Many provincial governors and judges have also been relieved of their duties. According to state media, prosecutors have begun questioning an alleged ringleader of the coup attempt, former air force commander Akin Ozturk. The Turkish government accuses cleric Fethullah Gulen of being behind the plot.